Alcohol dependence is a chronic relapsing disorder. Despite significant strides in the development of efficacious behavioral and pharmacological treatments for alcohol dependence, relapse rates remain very high. 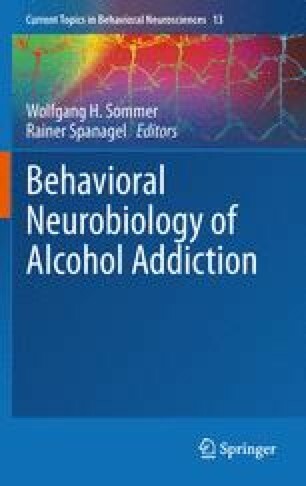 In this chapter, we review validated animal and human laboratory models for assessing risk of relapse in alcohol dependence and neurobiological treatment targets derived from such models. We suggest a translational approach to evaluate potential pharmacological treatments, using existing medications to validate and refine research paradigms across clinical and pre-clinical domains, with the aim of providing an accelerated framework for medications development in alcohol dependence. Lastly, empirical findings from proof-of-concept human laboratory studies are reviewed as we discuss the importance of selecting human laboratory models with predictive validity for the mechanism of action of the drug undergoing evaluation for efficacy in alcohol dependence. Preparation of this review was supported by NIAAA grant numbers RO1AA12602 and R37AA014028 to BJM and the Pearson Center for Alcoholism and Addiction Research.